Teaching Experience : Niamh has been tutoring law since graduating last year from Trinity Hall, Cambridge. She will be starting her LPC this year, following which she will be undertaking a training contract with the prestigious law firm Freshfileds Bruckhaus Deringer. 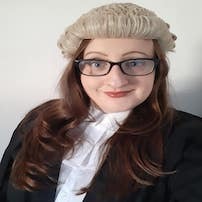 She currently tutors in Criminal, Public, Tort and Land law, and also holds first class results in Intellectual Property law, European Union law, Equity and Trusts law, and Comparative law.